I. Reading II. Speaking III. Listening IV. Writing VI. 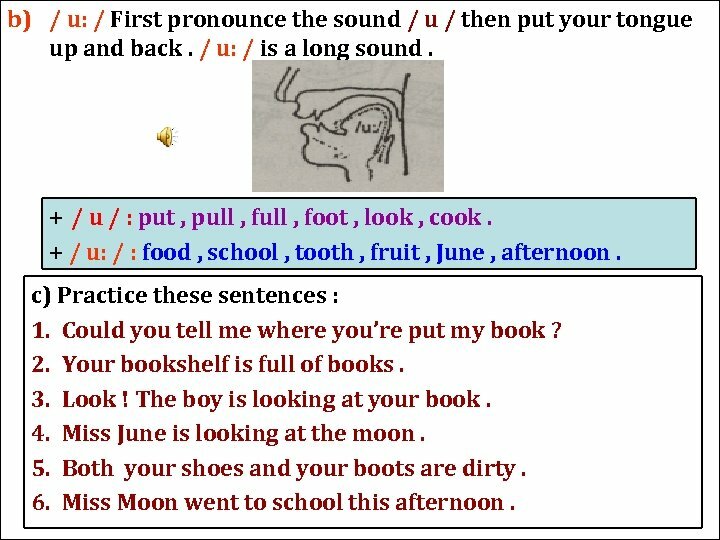 Language Focus Pronunciation : / u / and / u: / / u / : First pronounce the sound / a / then put the back of your tongue forward and up a little. / u / is a short sound. 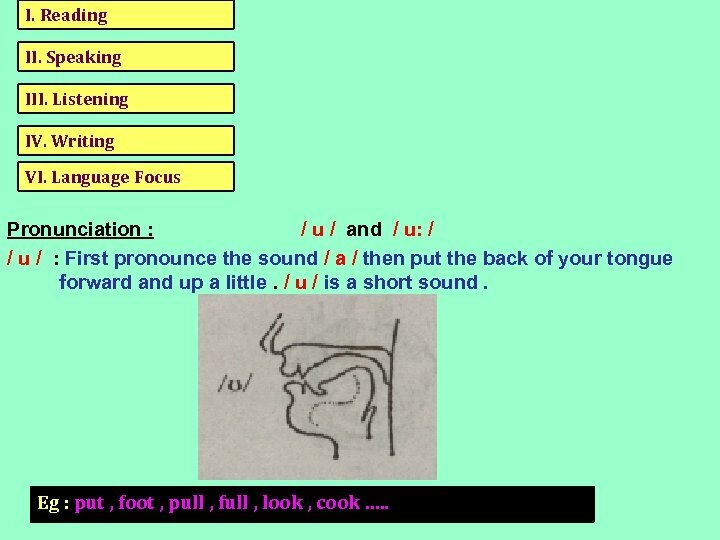 Eg : put , foot , pull , full , look , cook …. .
b) / u: / First pronounce the sound / u / then put your tongue up and back. / u: / is a long sound. + / u / : put , pull , foot , look , cook. + / u: / : food , school , tooth , fruit , June , afternoon. c) Practice these sentences : 1. Could you tell me where you’re put my book ? 2. Your bookshelf is full of books. 3. Look ! The boy is looking at your book. 4. Miss June is looking at the moon. 5. Both your shoes and your boots are dirty. 6. Miss Moon went to school this afternoon. 2. Grammar and Vocabulary. The present perfect tense. * Form : ( + ) : S + have/has + PP + ( O ). ( - ) : S + haven’t / hasn’t + PP + ( O ). ( ? ) : Have / Has + S + PP + ( O ) + ? Yes , S + have / has. No , S + haven’t / hasn’t. * Form : + Expresses an action which began in the past and still continues. + The time expressions that are common with this use : since , for , already , recently , yet , never , up to now ……. Eg : I have worked as a teacher for twelve years. 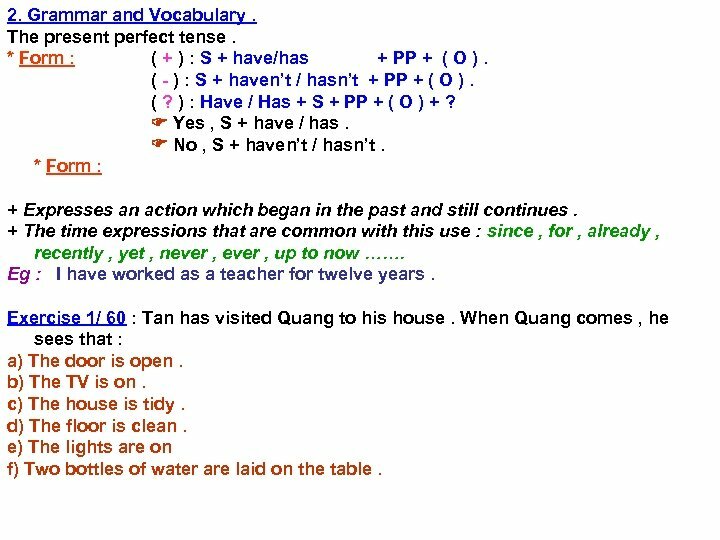 Exercise 1/ 60 : Tan has visited Quang to his house. When Quang comes , he sees that : a) The door is open. b) The TV is on. c) The house is tidy. d) The floor is clean. e) The lights are on f) Two bottles of water are laid on the table. Write in your exercise book what you think Tan has done before Quang comes. a) Tan has opened the door. b) Tan has turned on the TV. c) Tan had tidied the house. d) Tan has cleaned the floor. e) Tan has turned on the lights. f) Tan has laid two bottles of water on the table. 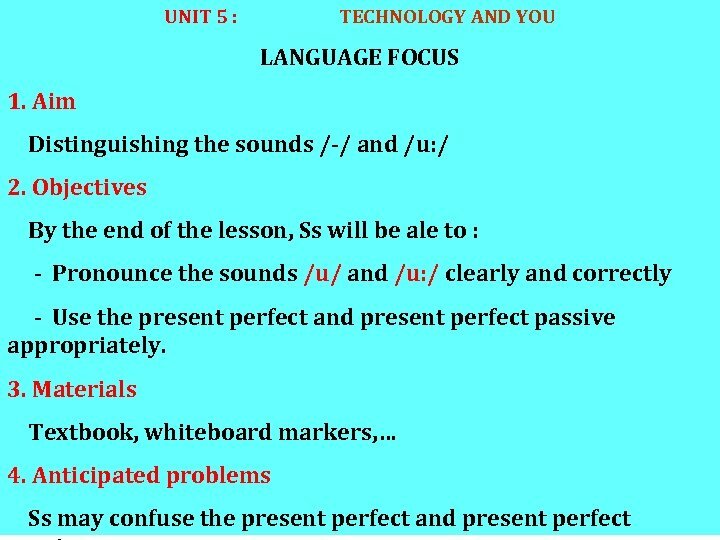 b) The present perfect tense passive voice. A : S + HAVE / HAS + PP + O. S+ HAVE / HAS + BEEN + PP + (BY + O ) Eg : A : They have built a new bridge across the river. B : A new bridge has been built across the river. Exercise 2 / 61 : Eg : Build sentences after the model new / bridge / build / across the river. A new bridge has been built across the river. 1/ A new hospital for children has been built in our city. 2/ Another man-made satellite has been sent up into space. 3/ More and more trees have been cut down for woods by farmers. 4/ Thousands of animals have been killed in the forest fire. 5/ About one hundred buildings and houses have been destroyed in the earthquake. 6/ More than 50 films have been shown in Hanoi since June. 7/ Their hands have been washed and dried on a towel. 8/ Another book has been read by the students. 9/ Some ink has been spilt on the carpet. 10/ She has been shown how to do it. 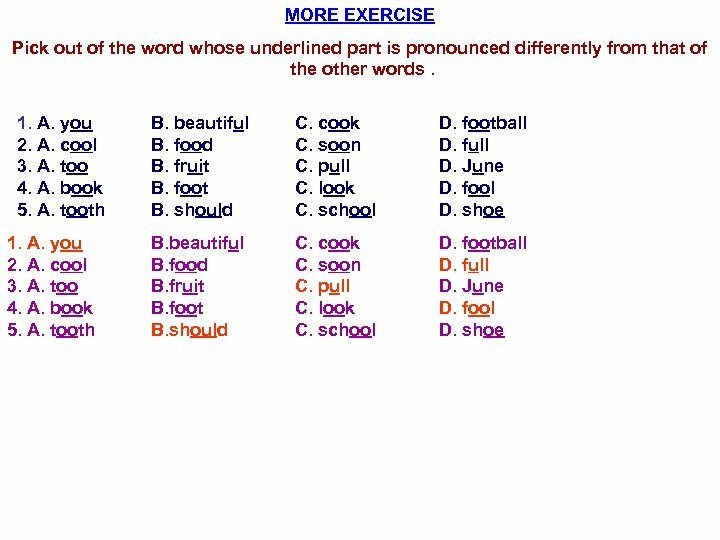 c) Relative pronouns : WHO , WHICH , THAT : Can be used in place of noun subjects and noun objects. * WHO : Refers to people. * WHICH : Refers to things. * THAT : Replaces for WHO , WHICH in the restrictive clause. * When they refer to subject , or object , they can normally be omitted. Eg : 1/ This is the man who(m) I like. 2/ These are the machines which my uncle repaired. Exercise 1/ 61 : Fill in the blank with : WHO , WHICH , or THAT 1. A clock is an instrument which tells you the time. 2. A fridge is a machine which is used for keeping food fresh. 3. April 1 st is the day which is called April Fool’s Day in the West. 4. A nurse is the person who looks after patients. 5. A teacher is a person who gives lessons to students. 6. A blind person is the one who can not see anything. 7. The man who(m) you visited last month is a famous scientist. 8. Please think of the word which/that comes from a foreign language into Vietnamese. 9. These are the pictures which my son drew when he was young. 10. Can you help me find the man who saved the girl ? • HOMEWORK 1. Make 5 sentences with the present perfect tense. 2. 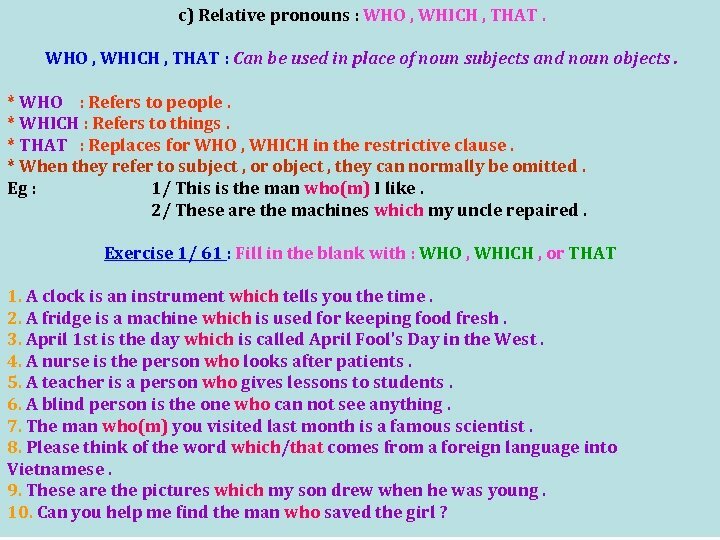 Make 5 sentences with relative pronouns : WHO, WHICH, THAT. 3. 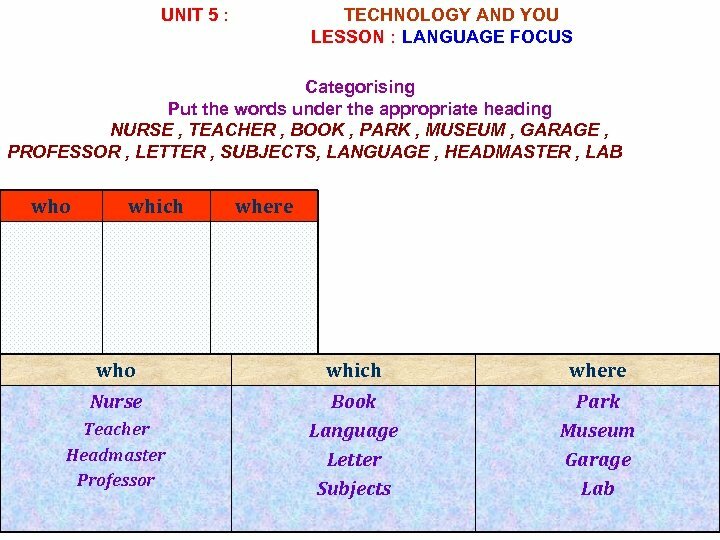 Prepare Unit 6 : READING. • + New words. 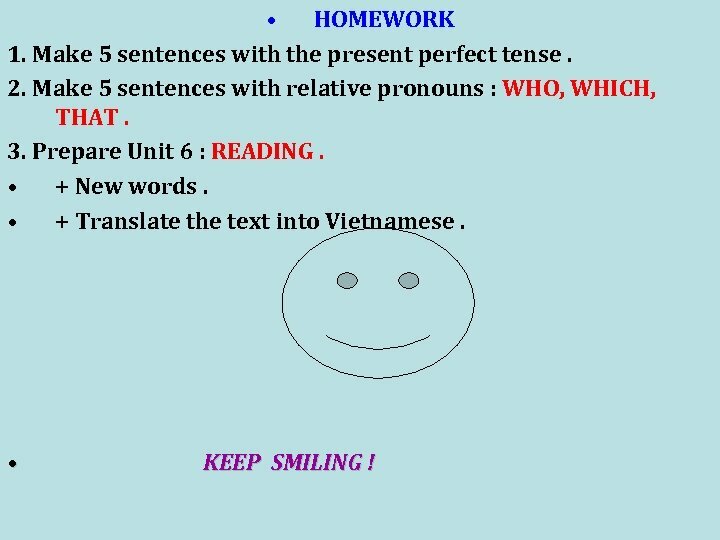 • + Translate the text into Vietnamese. • KEEP SMILING !